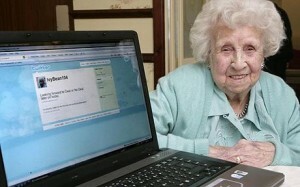 Did The UK Press Con A 104-Year-Old Woman Into Joining Twitter For Digg Bait? There’s a popular story on Digg right now about a 104-year-old British woman who uses Twitter. It’s an obvious headline: “World’s oldest Tweeter talks cuppas and casserole.” It’s Digg bait. But what’s worse is that if you examine the story closely, it looks like the UK press may have gotten the poor old lady to sign up for Twitter just for their story! The story is about how Ivy Bean uses the hot social network to post mundane updates about her 104-year-old life. But take a look at the picture in the story. On the screen next to Bean, you’ll see her Twitter page with a whopping two updates. These two tweets were sent out at the same time, the day before the story ran in a number of UK publications. In other words, Bean signed up and sent her first two tweets at the time all these guys were writing their stories. Or, to put it more clearly, this whole story was staged. Bean sent out her first tweet at 2:02PM PST (6:02PM local time in the UK) on May 14, it read “I’m enjoying Twitter for the first time and having my photo taken” (the picture used in the articles). The Sun, which also ran the story, has an even better headline. “103-year-old Ivy loves to Twitter” — clearly, she does — I mean, she had been using the service for a whole two seconds before the story was being reported. Worse, The Sun gets poor Bean’s age wrong (they say she’s 103 years old). We get some flack for running a lot of stories about Twitter, but this is just pathetic. Though maybe it shouldn’t be surprising. Twitter is red-hot right now and “world’s oldest Twitterer” is an easy Digg headline. And the Telegraph, which did get the Digg headline, gets nearly 10% of its traffic from Digg, according to Compete. Does anyone know any 105-year-olds? I need to contact them for a story. And I’ll be nice enough to give them a Twitter ID that doesn’t imply they won’t make it to their next birthday.